Custom car flags and flag advertising, with polyester flags and mini flags, even windsocks and banners plus a whole lot more. When it comes to versatile flag advertising, not many things get the widespread exposure of car flags and pennants. From novelty car window flags to car sale banners, we've got the ability to create the custom printed flags you need for almost any application. From windsocks and banners to team flags for car windows and beyond, we're your premier online retailer for car flags, custom pennants, as well as banners. 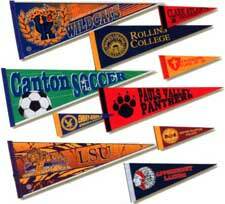 Our customizable polyester flags and mini flags all come with a plastic flag pole, for your convenience. We even offer a variety of sizes for the plastic flag pole. You can choose from 13", 17" or even 20". Our custom car flag selection and team flags for car windows give you the power to choose, from the design and color right down to the presentation. From novelty car window flags and pennants to car sale banners and beyond, make custom printed flags from us your first choice. So for all of your car window flags and custom printed flags for flag advertising and a whole lot more, BlowoutBanners.com continues to be the only choice. From car flags and mini flags to team flags for car windows, even windsocks and banners, we offer comprehensive coverage of your flag advertising or team merchandising needs. With pennants and polyester flags from us you can send the message that you or your business has arrived and are here to stay.